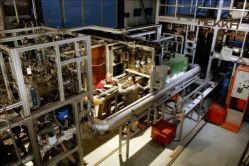 Objectives: Magnetohydrodynamic (MHD) research performed in the experimental facility MEKKA aims to investigate liquid metal flows relevant for fusion applications, where the magnetic field that confines the plasma is very strong. Short description: The MEKKA-facility (Figs.1, 2) consists of a large Na22K78 liquid metal loop and two magnets. The entire NaK loop with the test section can be moved on rails along the axis of each magnet. This allows a good access to the instrumented test section and variable positioning of the experiment within the magnets. This facility is capable of attaining MHD-parameters relevant for liquid-metal fusion blankets (Interaction parameters in the range of N=102-105, Hartmann numbers up to Ha=104).